(IslamDag) - Indonesian Ambassador Hamid Awaluddin hoisted the national flag on Wednesday to mark the beginning of the 66th Independence Day celebrations of his country in Russia. Embassy officials, Indonesian students and expatriates, invited guests and dignitaries around 200 guests were present. Hari Proklamasi Kemerdekaan Negara, or Indonesian Independence Day is celebrated yearly on August 17th to mark the Proclamation of Indonesian Independence declared on Friday, August 17, 1945. 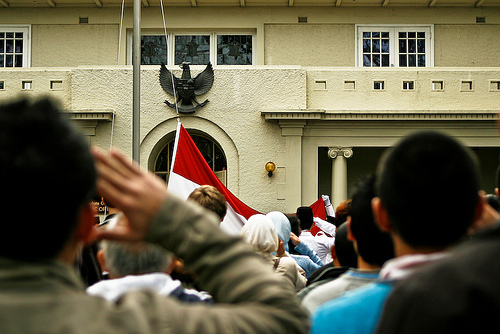 Prior to the proclamation, Indonesia had been colonized by the Portuguese, Dutch, and Japanese for over 300 years. 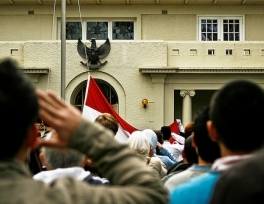 As such, the independence day is also called as Hari Proklamasi Kemerdekaan Republik Indonesia. Following the tradition the ceremony in Moscow began at 10.00 a.m. with the recitation of Holy Quran. In his speech following the flag hoisting ceremony, Hamid read out Indonesian President Susilo Bambang Yudhoyono's address to the nation. He took the opportunity to thank government officials, expatriates, embassy officials and well-wishers of Indonesia who extended their fullest cooperation to make today's function a successful event. "Hari Kemerdekaan is a special day to thank God, reflect on our past, remember our heroes, and unite for our future," Ambassador said. "Each one of us is a representative of a great nation, Indonesia. Language, attitude and all our behavior is a mirror of the civilization that was built from the long journey of our nation, and with that mirror other nations judge Indonesia," he added. A colorful ceremony was also held on the embassy premises. Children from the Indonesian School in Moscow sang patriotic songs much to the delight of those present. As part of the activities organised by the Embassy, a team of Indonesian nationals ascended the highest summit in Europe, mount Elbrus, to mark the independence day. Among the team members was Sabar who set record for the first one legged person to conquer the Elbrus summit from the Northern trail. Embassy courtyard sprout large banners and decorated in unique series of red and white lighted designs, fences around the embassy and offices draped in red and white bunting, pompous tables with Indonesian delicacies - all these created unique spirit and atmosphere of joy and celebration and enchanted the large gathering of Indonesian nationals living in Russia.